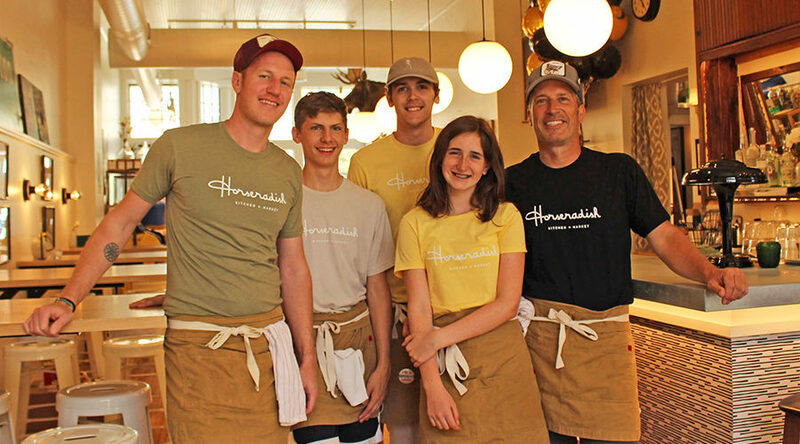 Standing in their new Horseradish restaurant are, from left, Matt Trotter, Bennett Drake, Atticus Hiestand, Lauren Pearsall and Alex Pearsall. The Princeton restaurant opened Memorial Day weekend. Ariana Hones photo. In between looking for a mop bucket and saying goodbye to the steady stream of satisfied customers, Matt Trotter, donning a well-worn Horseradish T-shirt that is less than 2 months old, sits down for what appears to be the first time that day. “Tired, but good,” Trotter says with a smile. Born from a winter-time, movie-watching experience, Horseradish brings inventive flavors with local roots to the community’s palate. “I had a retail store, Teak & Soxy, across the street and I watched the movie ‘Chef’ over the winter, so I thought it would be a fun way to expand what was happening in the store — offering some different foods than what you typically see around here. In summer 2015: Horseradish, the food truck was born. Trotter’s vision for the community always has revolved around cultivating an eclectic atmosphere. Summer 2016 brought numerous expansions as Trotter created more seating options and acquired a liquor license for the food truck. However, Horseradish was never suppose to move beyond its four-wheeled home. But then, people started to talk. “We went from serving 20 people on a Saturday to over 100 people,” Trotter said. One of those people was Alex Pearsall. From January 2017 to Memorial Day weekend 2018, that is exactly what Trotter and Pearsall did. They refurbished the inside of a historic downtown Princeton building to bring a harmonious balance of old meets new in both decor and menu. “We wanted a space that felt both original and jazzed up with our personalities,” Trotter said. Like the giant moose head that greets customers as they walk in. A native of Princeton and graduate from the University of Wisconsin-Milwaukee in visual arts, Trotter seems content with challenging expectations. Much like the naming process for this debut process, everything Trotter does weaves a twist into what is seemingly familiar. Trotter seeks out innovation, yet stays true to the methods of excellence when it comes to sourcing products. “We like to find people that are doing one thing and doing that thing the best,” he said. From Boerson Farm vegetables to Renard’s European Bakery, Trotter emphasizes how important the greater community is to the success of Horseradish. In the quieter winter months, Trotter and Pearsall hope to have more time to think creatively about what is next for Horseradish. But for now, in the heat of the summer, customers can find sanctuary in Horseradish’s delicious bites and beautiful locale as it straddles both bustling downtown Princeton and the Fox River. Trotter’s favorite is the classic Caprese sandwich, beloved for its summer-ripe tomatoes and fresh mozzarella. But the beet sandwich being taken off the menu is just what happened recently. The reason, however, was justifiable. “We ran out of beets,” Trotter said.